Pink Floyd recently celebrated their early years with a massive box set spanning from the bandâ€™s formation in 1965 up until the recording of Dark Side of the Moon in 1972. Crucial for this period, was the transition between Syd Barrett and David Gilmour and how Gilmourâ€™s evolving tone, shaped the sound of the bandâ€™s early albums. This is an updated version of the original feature posted in May 2008. After Sydâ€™s departure in early 1968 Pink Floyd struggled to free themselves from the psychedelia label. It was also a struggle to maintain some level of creativity without their former songwriter. While 1968-69 was a period of trying to find his place in the band, the years between 1970-72 saw David experimenting a lot more both with his tone and different styles. – 1966-67 all stock Fender Stratocaster with a white ash body, white pickguard and a rosewood 4-bolt neck with a large headstock. – Fender Telecaster of unknown date with natural brown body, white pickguard and a maple neck. – 1969 all stock Fender Stratocaster with a black alder body, white pickguard and a rosewood 4-bolt neck with a large headstock. (left) David pictured with the white Strat he'd been using since summer 1968. The guitar got stolen on 16 May 1970 in New Orleans along with the rest of the band's equipment. (right) Pink Floyd headlined the Hyde Park Free Concert 18 July 1970. David played a sunburst 1959 Fender Stratocaster with a 1963 neck. The neck was later fitted onto the Black Strat in June 1972 and stayed on until late summer 1978. – 3 Hiwatt DR103 All Purpose 100W heads with Mullard 4xEL34â€™s power tubes and 4xECC83â€™s pre-amp tubes. Controls for normal volume, brilliance volume, bass, middle, treble, presence and master. – 3 WEM Super Starfinder 200 cabinets with 4Ã—12â€ Fane Crescendo speakers with metal dust caps. Pink Floyd’s soundtrack album More (1969), did have some success in the States and it gave the band the opportunity to tour the country twice in 1970. On 28 April Pink Floyd recorded a one-hour TV-special for PBS TV at the KQED studios in San Francisco, USA. Being a small TV studio, the band had to scale down their equipment and David used only one Hiwatt head with a WEM cabinet. Still, the performance is a great reference for Pink Floydâ€™s sound at the time. – Cymbaline from the KQED session in San Francisco, USA, 28 April 1970. Notice David’s scaled down rig with only one Hiwatt head and a WEM cab. You can also spot the Binson Echorec. The Stratocaster was bought at Manny’s in New York just a couple of weeks before the filming and it was later stolen in New Orleans 16 May. David brought only the white Stratocaster to the States and after landing in New York in early April he bought a new 1969 black Stratocaster with a rosewood neck and white pickguard at Mannyâ€™s. The guitar was used on the following shows and featured on the on the KQED session. Sadly Pink Floydâ€™s equipment got stolen in May and although most of it was safely returned, Davidâ€™s white and the new black rosewood Strats were lost. Floyd was forced to cancel the rest of the shows and David returned to Mannyâ€™s and bought a new black 1969 Fender Stratocaster, this one with a maple neck. The guitar was David’s main guitar up until 1985 and again from 2005 to recent. The guitar is lovingly referred to as The Black Strat. The Black Strat made its debut appearance at the Bath Festival of Blues and Progressive Music on 27 June 1970 in front of 150.000 people. Pink Floyd had been performing a stripped down band version of Atom Heart Mother, the title track of their new album, since January but this was the first time they performed the suite with a full brass band and choir. On 18 July Pink Floyd headlined the Blackhillâ€™s Garden Party – Hyde Park Free Concert and David is seen with a 1959 sunburst Fender Stratocaster with a 1963 rosewood neck. This was a gift from Steve Marriott from Humble Pie/Small Faces. Later, in June 1972, David would swap the neck with the maple on the Black Strat. The festival is also interesting because WEM used the event to showcase their new PA system and it was around this time that David started with the 4 WEM speaker cab setup he used throughout the 70â€™s. On 8 August 1970 Pink Floyd played at the Festival de St Tropez. The whole performance was filmed by French TV and recently surfaced on several bootleg sites. Itâ€™s an awesome showcase of Floydâ€™s gear and sound from the period, with unique versions of Embryo and Atom Heart Mother (band version). David is using a white Fender Stratocaster with a rosewood neck that heâ€™d purchased in a second hand shop in London earlier that summer. For some reason, he removed the pickup covers on the guitar and according to Phil Taylorâ€™s book â€œThe Black Strat – A History of David Gilmourâ€™s black Fender Stratocasterâ€ the pickups were replaced by custom stereo onesin the mid 70’s. Apparently David still has the guitar. While playing in Vancouver, Canada in early October David met up with luthier Bill Lewis and bought one of his guitars. It was unique and quite ahead of its time with custom humbuckers and a single piece mahogany body. The guitar is first seen on stage in Copenhagen 12 November and on a TV performance for ORTF Studios, Paris, France 4 December. More about the Bill Lewis guitar here. Again in Vancouver David also visited a pawn shop and reportedly bought a Gibson TV with P90 pickups and a blonde Fender 1000 double neck pedal steel. The twin neck was used on Meddle and several tracks on Dark Side on the Moon, notably Breathe and Great Gig in the Sky. It was also used on a couple of shows in June 1974 and can be seen on the BBC Dark Side of the Moon documentary from 2003. As talked about in part one of this article, Davidâ€™s style was very much based on having to play Sydâ€™s old guitar parts and songs, as well as a strong contemporary influence from Jimi Hendrix. By summer 1970, with the new album and a lot of touring, David seems much more confident with his place in the band and his own playing and he’s embracing his roots in the blues from the 1930s, 40s and 50s and legends like Leadbelly, Pete Seeger and BB King, which whom made him start playing guitar as a teenager. The influence is evident on songs like Atom Heart Mother, Fat Old Sun and live versions of Embryo. In my opinion, Davidâ€™s playing on Atom Heart Mother (album) is much more reminiscent of Wish You Were than the typical Hendrix, space rock style on Meddle and Dark Side of The Moon. With Fat Old Sun David had also managed to establish himself as a contributing songwriter. Itâ€™s a pattern that goes right up to songs like High Hopes, Lost for Words and On an Island, where David blends his love for classic blues and folk traditions with lyrics about childhood memories from Cambridge and absent friends. In a sense, Davidâ€™s writing on both Atom Heart Mother and Meddle is very much reminiscent of Division Bell and On an Island. Atom Heart Mother is also a great showcase of the germanium fuzz tone and how David used it for boost and overdrive rather than the typical oversaturated, earpinching Hendrix tone. David developed techniques by using the volume control on the guitar to adjust the gain on the Fuzz Face and what you hear throughout Atom Heart Mother (the track) is a Stratocaster with the germanium model Fuzz Face (NKT275). David is also seen experimenting with different pedals throughout spring 1970. At Fillmore East, New York 16 April, an undocumented fuzz unit looking very much like a Sola Sound/Marshall Supa Fuzz lies next to the other pedals. Many sources also mentions an Orange Treble Booster being used on the albums and tours from the period. However, this is more likely a misunderstanding based on a comment David made in an 1978 interview, where he mentioned an “orange treble and bass booster”. At the time of the interview, he did indeed use an orange Colorsound Powerbooster. 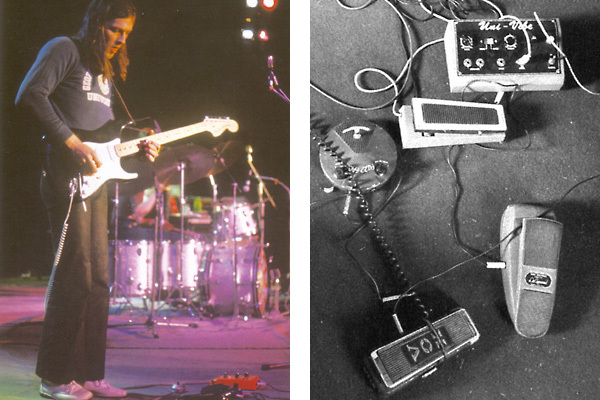 David started using Fuzz Face pedals with silicon transistors sometime during the first half of 1971. Listening to bootlegs from the spring tour, it’s hard to tell whether he used a germanium or silicon model or even both but by the time they filmed Live at Pompeii in October 1971, it was all silicon Fuzz Faces. Compared to the warm overdrive from the germanium transistor the silicon has a bright, edgy tone with slightly more gain. Compare Davidâ€™s tone on Atom Heart Mother with songs like When Youâ€™re In and Time and youâ€™ll hear the difference. David also added a DeArmond volume pedal to be able to tame the new fuzz unit, since the silicon transistor doesnâ€™t respond that well to using the guitar volume for gain and volume adjustment. The DeArmond is seen placed in front of the fuzz, which might seem strange, but it makes sense, as David wanted to be able to control the input signal just like using the guitar volume knob. More about the Fuzz Face here. Itâ€™s not documented what David might have used for overdrive tones during the 1971 tours. He might have just used the guitar volume to control the gain as he did the prior years. One theory is that he might have used both germanium and silicon Fuzz Faces, the germanium for overdrive and the silicon for leads. Pictures from the Crystal Palace Bowl 15 May 1971 reveals two Fuzz Face pedals in his setup and audio sources definitely confirms an overdrive unit in addition to the typical silicon tone. 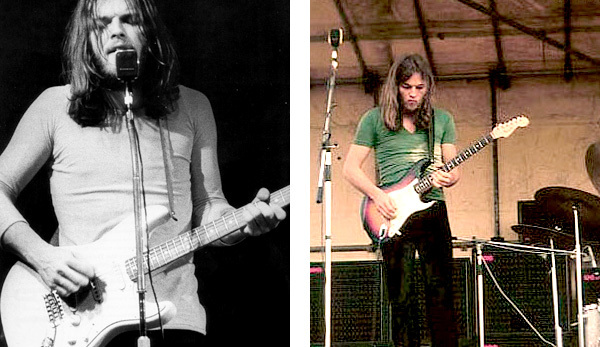 The theory can be supported by the fact that Pink Floyd still played many of the old songs where David would typically use the germanium fuzz like Astronomy Domine, Cymbaline, Atom Heart Mother and Embryo. Again, the (Orange) treble booster claim is false and David didnâ€™t start using the Colorsound Power Boost until early 1972. David had now settled with the classic setup of 3 Hiwatt heads placed in a custom rack and the 4 WEM speaker cabinets. He had also started using a Leslie on stage, powered by one, and sometimes two, HH IC-100 solid state heads serving as preamps. – 4 WEM Super Starfinder 200 cabinets with 4Ã—12â€ Fane Crescendo speakers with metal dust caps. Hailed by many as the greatest concert film ever made, Pink Floyd’s Live at Pompeii was filmed in the ruins of an old amphitheatre in Pompeii, Italy, between 4-7 October 1971. The film is a superb reference for Pink Floydâ€™s and Davidâ€™s equipment and sound from the era. Most of the songs are filmed and recorded in Pompeii, while Careful with that Axe, Eugene and Set the Controls for the Heart of the Sun were both filmed at the Studio Europasinor in Paris, France 13-20 December 1971. They all did a lot of overdubs and the fact that they didnâ€™t produce the soundtrack themselves, makes the whole film sound somewhat different to how they normally sounded on stage. Davidâ€™s tone on especially Echoes is a favourite among many fans, – the bright, punchy clean tone and screaming fuzz with endless sustain. Again, it should be mentioned that most of Davidâ€™s guitar was dubbed in the studio, so what you hear is possibly a mix between the live sound and dubbed sound, which can be a bit tricky to replicate. See the Live at Pompeii Gear Guide for a complete list of Davidâ€™s equipment. – Echoes (part 1) performed in the ruins in Pompeii. After years of speculation it was finally confirmed in Phil Taylorâ€™s book â€œThe Black Strat – A History of David Gilmourâ€™s black Fender Stratocasterâ€ that the Stratocaster used on Live at Pompeii is indeed the Black Strat. More on that here. Live at Pompeii was an as much a closure of the early era, as it was a showcase of all their equipment. Although they toured for the rest of the year with the same set songs, they knew they had to write new material. A couple of weeks off around Christmas was enough for Waters to write an entire album and the band used January 1972 to rehearse what would become the main suite for the next tour and eventually end up released as Dark Side of the Moon well over a year and a half after the concert premiÃ¨re. David expanded his tone and setup even further with the new songs written for Dark Side of the Moon. A UniVox Uni-Vibe was introduced on songs like Breathe and Brain Damage and a Colorsound Power Boost (placed in front of the Fuzz Face) was used for overdrives and for boosting the (silicon) Fuzz Face for leads. - (left) David pictured at the Rainbow Theatre, London, UK, 17 Febuary 1972 with his pedals, - Colorsound Power Booster (noticed that the bass knob is taken off), Dallas Arbiter Fuzz Face (silicon), Vox wah wah, DeArmond volume pedal and a footswitch for the Binson Echorec. (right) Setup from the Obscured by Clouds recording sessions in early 1972: UniVibe, Fuzz Face, Vox wah wah and DeArmond volume pedal. A Colorsound Powerboost is also spotted for the sessions. David would also integrate the Leslie speaker into his overall tone. The cabinet was mixed slightly lower than the Hiwatts and the result was a fatter tone, with great depth and character, rather than the typical swirling rotating speaker tone. David also had a second microphone hooked up to the Leslie, which he used to sing a long with his solo on Any Colour You Like just like he would later do on Wish You Were Here. The Black Strat remained as Davidâ€™s main guitar and in June of 1972, he would swap the â€™63 rosewood neck from the sunburst Strat with the maple neck from the Black. The sunburst guitar, now with the maple neck, was used occasionally throughout the tour both as a spare and with an open Em tuning for One of These Days. This was before David would use lap steels on stage. A second (in fact the third counting the black/rosewood from April 1970) black Strat with a maple neck, large headstock and the familiar bullet truss rod, was also used as a spare throughout the tour. While both Atom Heart Mother and Meddle was firmly rooted in the blues and folk traditions, Dark Side of the Moon was a mix of modern rock, jazz and soul. Davidâ€™s tone on Dark Side is heavier, edgy and more coloured by studio treatments compared to the natural tone on Atom Heart Mother and Meedle. Obscured By Clouds falls somewhat in between with the typical bright silicon fuzz tones from Dark Side but a much more honest tone. David would mostly record his guitars alone because no one could stand being in the same room as his amps. He would play extremely loud to get that rich sustain on songs like Time and Money. Both songs also features a silicon model Fuzz Face being used for the rhythms. Itâ€™s also interesting to hear how David uses similar patterns on different songs. The funky section on Atom Heart and Echoes, Childhoodâ€™s End and Time are all pretty much identical. David is basically following the drums with his strumming, – low strings on the bass drum and high strings on the snare. Gearwise David would more or less use the same guitars, amps and effects on both recording sessions and on stage. The Black Strat was used on all the albums, including the last sessions for Atom Heart Mother (David bought the guitar in the middle of the recordings). Most of the Atom Heart Mother album and songs like A Pillow of Winds, Fearless, Wotâ€™sâ€¦ Uh the Deal and Free Four, featured acoustic guitars, – a Gibson J-45 acoustic steel string. Pink Floyd continued to tour throughout 1972 and the songs for their new album would be rearranged, rewritten and changed dramatically before they ended up on Dark Side of the Moon in March 1973. It was an effective method and allowed the band to use the audience as a reference for new ideas and arrangements. 1972 was also the last year David had his pedals lying spread out on the stage floor and in early 1973 he would get his first pedal board built by him self and stage technician Chris Adamson. Davidâ€™s playing and tone from these five years still stands as a favourite for many fans. It was pure in the sense that Dvaid’s playing was the main focus. Itâ€™s also interesting to see that although Davidâ€™s rig has changed many times over the years, grown bigger and more complex, itâ€™s all based on the setups from these early years. Heâ€™s stilling using his old Hiwatts, the WEM cabs and the Fuzz Face and Colorsound Power Boost are replaced by similar sounding Big Muffs and Tube Drivers. I was looking at a bunch of pictures with David and his guitars recently, and noticed that the sunburst strat from Hyde Park ’70 appears to have a 1965 ‘transition’ style Fender logo, while pictures of the Black Strat fitted with rosewood fretboard from ’73-’78, appear to have the early style ‘spaghetti’ logo. Maybe I’m wrong, but is there a source that says that the rosewood fretboard neck that went on the Black Strat came off of that sunburst strat used at Hyde Park ’70? It is documented in Phil Taylor’s (David long-time guitar tech) book about the Black Strat. It’s the same neck according to that book. Hi Bjorn!!! Dave use any treble bleed with the fuzz faces??? thanks!! Not to my knowledge although I know the silicon FF on his late 70s Animals board was customized with a tone control. Bjorn, I have a problem. I’m running a MIM Fender Standard Stratocaster into a backwards VOX V847 Wah, then into a Boss BD-2, then an EH Big Muff Pi, then into a delay pedal. It kinda makes the seagulls effect, but not very well. It doesn’t get up to quite the right pitch, and it won’t do the laughing effect at the end either. PLEASE HELP!!! There might be a conflict with the buffer in the BD2. Try plugging the wah straight into the amp without any other pedals and see if that works. If so, you might want a true bypass pedal after the wah. Should I leave the Big Muff and delay or should I try just the wah and then add those things in one by one? Just plug the guitar backwards into the wah and straight to the amp. No other pedals. This will eliminate any issues and if it works, start adding the other pedals and see where the issue is. I’ve noticed in the many times I’ve watched Live At Pompeii that David seems to have both a germanium and a silicon Fuzz Face (I think). You can see them both at the same time if you watch Saucerful Of Secrets very carefully. One is in his rig and the other is resting beside the drums. Something interesting to check out. Yep he does. As far as I can tell, the germanium was never used but there are two pedals there. Thanks for this great coverage! One thing I notice about Echoes in the fantastic Pompeii movie is that the band’s tempo accidentally shifts around just a bit compared to the studio version. I discovered this while jamming to both versions and found that Nick’s tempo drifts just a bit in the live version, especially in the C#m-A solo passages. Of course, none of the boys are affected by this since at this time it’s as though they were in a four-way platonic marriage and approaching the height of their powers. 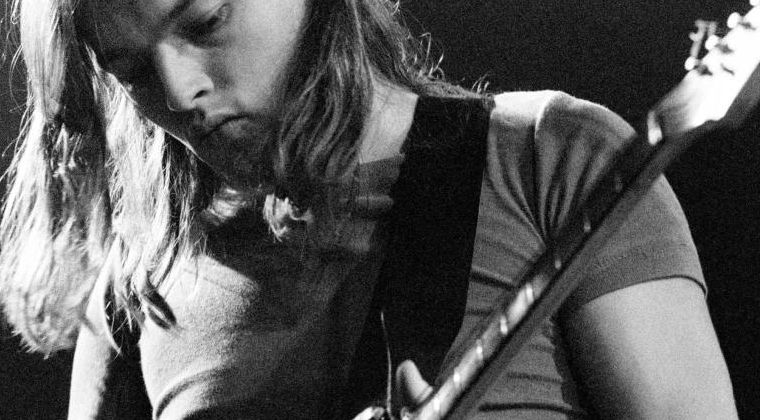 I had no idea they had overdubbed many of Gilmour’s guitar parts – they are so spot on. They also sound so different compared to the record. I think it’s the soundtrack that’s out of pitch here and there. Pink Floyd didn’t own any of it and they didn’t mix the recordings them selves. The soundtrack has been converted to many different formats over the years and it’s clearly out of pitch or too sharp. Wow, Unbelievable. I wonder how the principals (Waters, Gilmour. etc…) involved feel about that at this point. That movie was a key part of my coming-of-age years. Peace Bjorn, and thank you for all you do! Is it true that gilmour used the power boost after the fuzz? Since in images like the one you have posted from 1972 it seems that the guitar is connected first to the power boost and then to the fuzz. His coil spiral cable seems to confirm what I say. Hard to tell. I would imagine that he tried different things and, judging by the different live clips from the era, he mainly used either the Powerboost or the fuzz. The “normal” way would be to have it after but it’s hard to tell for certain what he did. Really great incite into the early years Bjorn, please keep the fantastic and inspirational learning journey going! Thank you, great article and very informative with a couple of great early video’s. I have purchased the electronic version of these early songs and have enjoyed them although I do prefer the later ones. Thanks again. Love the updates man. Im happy fuzz and vintage overdrive made a come back in recent years. A smooth fuzz tone can work well in todays rock easily. Depending on your style and genre I guess. What song and video was it you uploaded a while back where you used a bc-109 on an airbag song maybe? I can’t remember. I did record the solo on Redemption with the AnalogMan BC109. Yeah I was thinking about the live setup of the Fuzz Faces, recently I’ve been having a lot of fun using just the BC109 and my volume knob, something I thought was pretty useless before, but if you back the Fuzz to a sweet spot around 95% you get less screaming full volume but much better cleanup. It’s a great live tool. If you watch that section on Pompeii, you can see that the small on/off stomp switch for the Binson sits right next to the Fuzz Face. I don’t think it’s possible to stomp both at the same time. It’s certainly not easy and you can mess things up. It’s him switching them on/off so my guess is that he does it very fast and in this order ON: fuzz and delay OFF delay and fuzz. This way the fuzz kicks in instantly and you get a clean cut when you switch it off.